LINCOLN CITY — It’s a Community Days two-fer at the Lincoln City Cultural Center, set for Friday, April 26. From 4 to 6:30 pm, Oceana Family Literacy Center will present a reprise of “Secrets of Salsa & More,” in the halls of the LCCC. Oceana families will be bringing their best salsa recipes, and handing out complimentary bags of tortilla chips. You’re invited to dip, sample, talk to the cooks and learn about the recipes, and there will be limited quantities for sale, as well. After you’ve sampled the salsa, head down to the auditorium for a Community Days Concert with “guitarrista” James Kline. 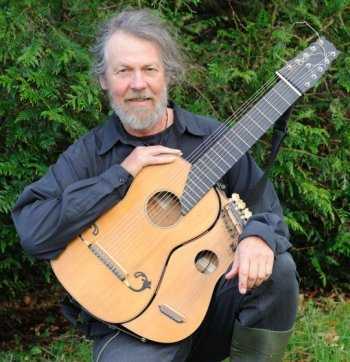 Classical guitarist, composer, singer-songwriter and innovator of the 19-string arch harp guitar, Kline is an artist who constantly renews and reinvents himself as he travels the world. As a classical guitarist he studied in Spain and England, but he has also worked as a wilderness guide and a commercial fisherman. He is co-founder of the neo-Celtic group Bardou, with whom he performs regularly Kline’s concert begins at 7 pm. Admission is by donation, and seating is first come, first served. Doors will open at 6:30 pm. As a classical guitarist, James Kline studied in Spain under a full scholarship from the Spanish government. There he won a number of international awards, including the Ramirez Prize of Santiago de Compostella and the Tarrega Pize of Benicasim. He holds an ARCM diploma from The Royal College of Music of London and has performed throughout eastern and western Europe as well as the United States and Mexico. He has also gained recognition as a composer and was awarded an Individual Artist Grant in music composition from the Marin Arts Council of California. As a singer-songwriter, Kline draws inspiration from a slightly more unusual life experience which includes years working as a commercial fisherman, working as a wilderness guide, extensive travel on four continents, and living among Mexico’s Tarahumara Indians. An interest in Renaissance and Baroque music led him to design his own version of the eleven string arch guitar, an instrument which combines the best qualities of the lute and the guitar. The urge to expand his horizons and dedicate more time to composing led James to co- found the neo Celtic group Bardou with whom he performs regularly. 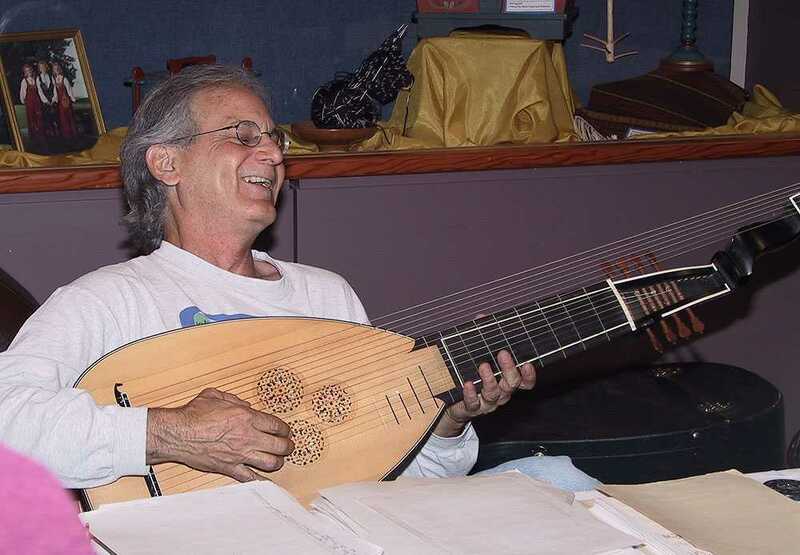 He has again reinvented his instrument to become the world’s only player of the 19 string arch harp guitar, a combination of lute, guitar, and Celtic harp. 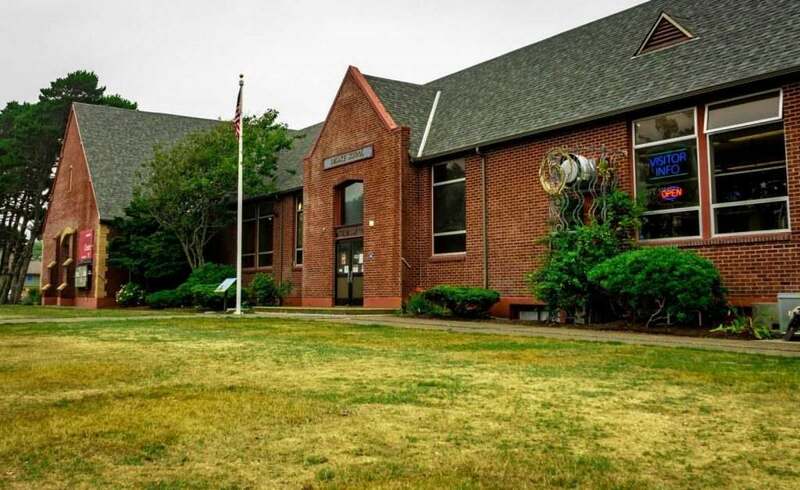 To learn more or join the LCCC, head to lincolncityculturalcenter.org or drop by the LCCC Information Center, open from 9 am to 5 pm Wednesday through Monday (closed Tuesday). Birds, prominent subject matter in Northwestern art, are honored in this annual Bird Themed Art Show. This year features the multimedia creations of Diane Archer, the photographic transfer based work of Nancy Abens, the handmade mobiles and cut paper sculpture of Elena Nikitin, the assemblage art of Jennifer Norman and paintings by Ronald Yasenchak. Diane A. Archer’s mixed media work is a continuing exploration of physical and emotional aspects of place. It is influenced by her studies of Deep Ecology and Bioregionalism, and informed by the practice of looking for the sacred in everyday life. 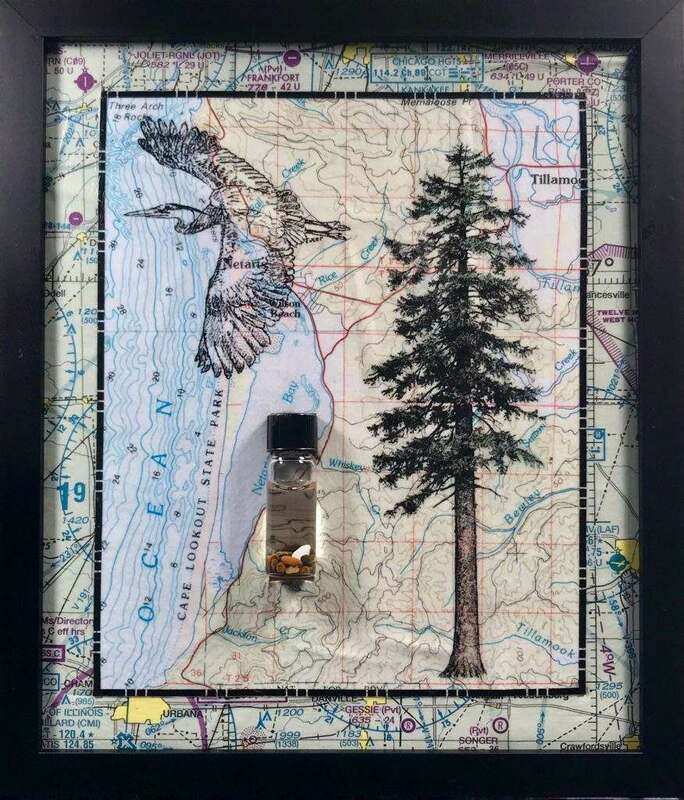 The work for this show is composed primarily of maps of Western Oregon, images of native trees and birds, and found objects. The maps have been altered, copied, enlarged and/or stained. Images are either drawn directly onto the maps or applied with image transfer methods. Found objects are added using vials, specimen cases and glass “windows” or are embedded directly into the substrata of the art. The finished art is coated with several layers of acrylic and/or wax to protect the surface from dirt and sun. All of Diane’s work is meant to acknowledge and celebrate our connections to the world around us and the world within us. Elena Nikitin does a variety of work including: watercolor and ink drawings, sculpture from cut paper, mobiles and oil paintings. The cut paper sculpture and mobiles made exclusively for this years annual Bird Show at the Chessman Gallery dazzle the eye and defies gravity, often suspended in mid air and are laced with detail. Elena Nikitin has a degree in Architecture and a background in Palekh miniature painting. Palekh is a Russian folk handicraft of a miniature painting, which is done with tempera paints on varnished articles made of papier-mâché (small boxes and powder cases etc.). Since the late 1990’s she has had four exhibits in Galleries in Portland, Oregon. Created by Oregon composer Ethan Gans-Morse and librettist Tiziana DellaRovere, “The Canticle of the Black Madonna” is a moving new opera that tells the story of a soldier with post-traumatic stress disorder (PTSD) returning from Afghanistan to his wife during the devastating 2010 Gulf Oil Spill in coastal Louisiana. It explores the healing power of transformation through divine love, embodied by the Black Madonna. “The Canticle of the Black Madonna” premiered in September 2014 at Portland’s Newmark Theatre, with an all-professional cast under nationally-renowned director Kristine McIntyre, formerly of the Metropolitan Opera. In its development, the opera raised $75,000 through crowd funding, making it one of the most successful productions of its kind. Coastal audiences will get another chance to see “Canticle” on April 13 and 14, at the Lincoln City Cultural Center. The LCCC will host two community screenings of “The Canticle of the Black Madonna,” filmed during the 2014 premiere. On Saturday, April 13, there will be a special preview talk with Gans-Morse and DellaRovere at 6 pm, followed by the screening at 7 pm. On Sunday, April 14, the screening will begin at 2 pm and will be followed by an open discussion moderated by Sean Davis, veterans service specialist. Admission is free. “In my career as a professional opera singer, I have premiered countless new works, but none has moved me so deeply as The Canticle of the Black Madonna,” said Pamela South, Grammy-Award winning soprano. “The Canticle of the Black Madonna opened my heart and brought new healing to me, 44 years after I returned from Vietnam,” said Bill Ritch, Silver Star recipient and former West Point instructor. “This is a gift that should be shared with the world,” he said. Bill Ritch, Silver Star recipient and former West Point instructor. Retired Oregon Army National Guardsman and Purple Heart recipient Sean Davis, serves as veteran service coordinator for the production. 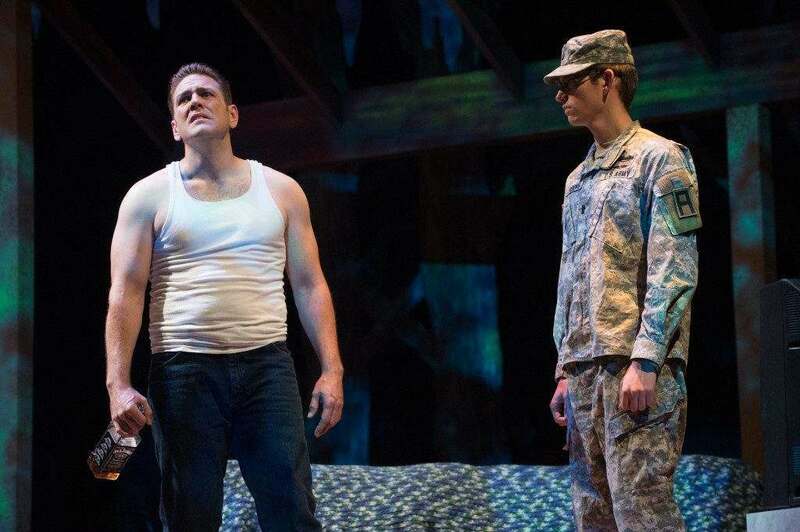 “The Canticle of the Black Madonna doesn’t only inspire the community with a beautiful story of survival and love, but Ethan Gans-Morse and Tiziana DellaRovere have gone out of their way to help veterans, sometimes behind the scenes” said Davis. “Much of the good they’ve done for veterans and their family members will never be seen by the public, but it has shown me that they not only talk the talk, they are actively taking action to help veterans and this inspires me to work even harder to do my part,” he said. You cannot lose when you buy a 50/50 Raffle Ticket as part of this year’s Culture, Of Course!, a benefit to support the Lincoln City Cultural Center. One lucky winner will take home three Ottoman Elegance rugs, each approximately 4’ x 6’6” imported from Turkey. The rugs were generously donated by Julie and Sener Otrugman of The Kelp Bed, in Lincoln City. Another lucky ticket holder will have an amazing dining experience at The Bay House, the dinner for two from the restaurant’s five-course tasting menu with wine pairings hosted by Steve Wilson, Owner of The Bay House. Chef Kevin Ryan presides over the kitchen at this elegant establishment, creating a fine, changing seafood and meat menu (posted daily on the website). Only the freshest top-quality ingredients are used, plus the view is stunning. Niki Price (left), Executive Director of the Lincoln City Cultural Center, presents the 2018 Grand Prize to winner Amy Graham. And the grand prize? CASH! If your ticket is drawn, you will receive half the proceeds from all the raffle sales – a minimum of $1,000 but perhaps as much as $5,000. The drawing will be held at this year’s Culture, Of Course! Benefit Dinner & Auction, set for Saturday, May 4. You need not be present to win. But, the greatest prize of all? Your contribution supports LCCC, including its many programs for the community. In 2018, LCCC hosted 322 events, from shows in the art gallery to Celtic concerts in the auditorium. From meetings to markets to mosaics, the LCCC offers programs for people of all ages and income levels – and the 50/50 raffle will help keep them coming in 2019 and beyond. Buy your raffle tickets now! Raffle chances are $20 each, or six for $100. Only 500 tickets will be sold, so get your tickets before they sell out! 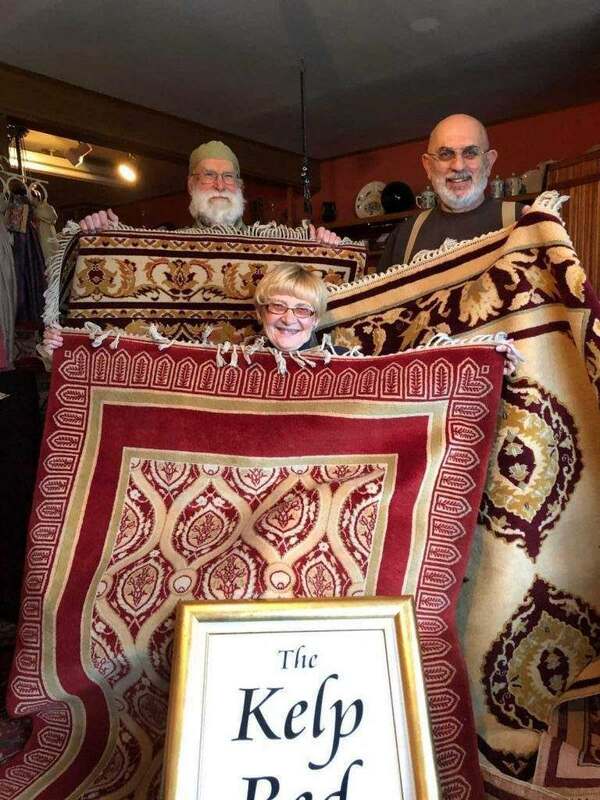 Sener Otrugman (right) and Julie Reynolds Otrugman pose with their friend Chester Noreikis and three “Ottoman Elegance” rugs, at The Kelp Bed in Oceanlake. The Otrugmans, who own the antique and kilim shop, have donated the rugs as a prize for the annual Culture, Of Course! 50/50 Raffle, benefitting the Lincoln City Cultural Center. You can buy tickets anytime online through the LCCC website, or in person at the LCCC Information Desk. You can also purchase tickets from Cultural Center Board members and Culture, Of Course! committee members. Come meet and buy tickets from the Board and Committee members on March 21 from 4-6 p.m. at Safeway and at McKays. To learn more, to purchase tickets, or to contribute to the cultural cause, call 541-994-9994. Buy Raffle Tickets TodayAbout Culture, Of Course! The Lincoln City Public Art Committee, the appointed advisory body that works to enliven and beautify our coastal town with art installations, is looking for two new members. Applications are available at Lincoln City Hall, 801 SW Hwy. 101, or at lincolncity.org (“Boards and Committees”). The Public Art Committee was formed in 2005, to improve the quality of life in the city by allowing residents and visitors to view and interact with art in public places. The committee makes recommendations on the acquisition, installation, and maintenance of publicly-owned art in city buildings and properties, using the city’s innovative Percent for Art Program. Through this program, the city sets aside ½ of one percent of the total cost of qualifying capital improvement projects for the design, purchase, and siting of public art projects within city limits. In addition, the Public Art Committee may receive allocations from the General Fund and may also apply for outside grant funding to accomplish its goals. The list of public artworks created through the Percent for Art program is long, and includes the whimsical creatures in front of the Lincoln City Community Center, Sparky the Wish Dragon at Regatta Park, the Cascade Head Sculpture at NW 18th St., “Dancing Water” at Hostetler Park and Joe the Sea Lion on SW 35th St. The program also installed colorful mosaic murals at the Jennifer Sears Glass Studio, the Community Center and on public restrooms in the Wecoma neighborhood. Currently, the committee is working on a number of different projects. Among the goals is the commission of a major artwork, with high visibility and scale, and with a budget of $70,000-$120,000. The Public Arts Committee typically meets on the second Wednesday of the month at 4:15 pm at the Lincoln City Cultural Center, 540 NE Hwy. 101 in Lincoln City. Committee members are appointed by the City Council, and serve three-year terms. There are two positions available. One is for a citizen who lives within the city limits. The other position can be filled by a resident who lives in the city, or within the area served by Taft 7-12, including Gleneden Beach, Coronado Shores, Otis and Rose Lodge. To apply, pick up a Committee Volunteer Application Packet at City Hall, or download the form from lincolncity.org, or call 541-996-2151. Applicants must agree to a background check, and complete interviews with members of the Lincoln City Council. Kids, families and those who love to wonder – you’re all invited to the 8th annual Festival of Illusions, March 24-April 4 at the Lincoln City Cultural Center. This year’s spring break fun fest will offer daytime activities including drop-in art workshops and evening performances by jugglers, mentalists, magicians and physical comedians from around the world. Advance tickets, reserved seating for the first time ever, are on sale now. New to this year’s lineup is Angel Ocasio, a nationally-recognized physical comedian who performs in both English and Spanish. He’s a graduate of the Ringling Bros. and Barnum & Bailey Clown College, and has performed with everyone from Pink Martini to Wayne Newton. He’s also been named the Clowns of America International “Clown of the Year.” Ocasio will be the featured act at 7 pm Wednesday, April 3. The 2019 Festival of Illusions schedule also features international mime and comedian Rudi Galindo, magician Jeff Evans, plate-spinner Henrik Bothe, mentalist Brian Ledbetter, Super Perfect Awesome Man Stefano Iaboni, and of course, two shows by The Amazing Bubble Man. The Festival of Illusions is planned to coincide with two special weeks: the Oregon public schools’ spring break March 25-29, and the Washington public schools’ version April 1-5. All evening shows begin at the same time: 7 pm, with doors open at 6:30 pm. Thanks to the festival’s premier sponsors, Oregon State Credit Union and Amy Graham at Taylor & Taylor Real Estate, and the Lincoln City Visitor & Convention Bureau, evening show tickets are $8 for youth ages 6-18, and $15 for adults 19 and older. Tickets are on sale now at the center’s website, by calling 541-994-9994, or in person at the Lincoln City Visitor Information Center, located inside the LCCC. The Chessman gallery, inside the Lincoln City Cultural Center is proud to announce its next exhibit, “2WATER WAYS” by Bill Shumway and Pam Serra-Wenz. This water themed body of work will be unveiled at the opening reception on Friday, March 8, 5 –7pm with wine, refreshments and a chance to meet the artists. Also unveiled at this time will be the new Chessman Schedule of shows for 2019 and the annual Chessman Art T shirts! This year’s design is by Liisa Rahkonen. This show will run until April 8. Bill Shumway and Pam Serra-Wenz have exhibited extensively in the Pacific Northwest. Both painters believe that water is the key to life on this planet and that people should pay heed to conserving and retaining our clean water resources. As artists, they have decided to bring attention to that issue by focusing on the characteristics of water and the beauty that water beholds in its natural setting. Both artists paint with acrylic and manipulate the surfaces in many intriguing ways, sometimes even leaving paintings out in the rain as part of the process! Water is to a large extent, transparent, except when it is infused with colorants from its environment. They’ve seen slow-moving mud-brown rivers and algae filled ponds and wetlands, not to mention waterways stained various colors around industrial effluents. The transparency allows for light to illuminate colors and forms beneath the surface. Deflected light and color often bounces back on surrounding objects and back again into and onto the water which is always moving. It redesigns itself constantly in value, reflective quality, and movement. It changes from moment to moment and is never the same. It is indeed a very complicated interaction and a real challenge for the artist to interpret with opaque pigments on a static two-dimensional surface. For both painters, painting water is, metaphorically, about as close to the creative act as one can get. Bill Shumway earned his Master’s Degree in Painting from the University of Massachusetts. He has been an artist, teacher, and arts consultant since 1968. Prior to moving to Corvallis, OR, in the mid-seventies, he operated galleries and frame studios in Amherst, Northampton and Martha’s Vineyard, MA. When he arrived in Corvallis, he was deeply moved by the wildness of Oregon’s multiple landscapes and decided to open up to new ways of seeing and painting while incorporating the elements of abstraction that he had previously embraced. 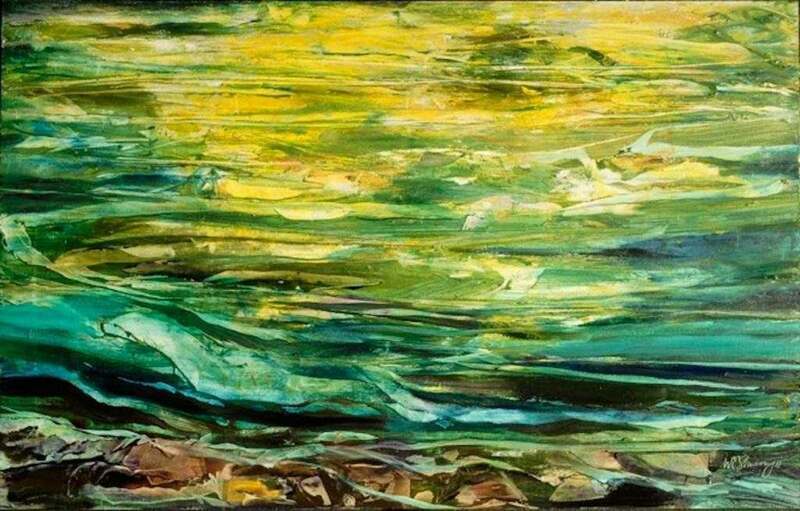 He shifted towards painting more directly and in the moment with new processes. He operated Pegasus Gallery for 35 years until his retirement in 2014. The gallery served regional and international artists over the years and generated collaborative events with other galleries. He also helped start and facilitate the Vistas & Vineyards en plein air program and co-chaired the art procurement committee for the Corvallis Arts Center annual Chocolate Fantasy fund raiser for more than a decade. Terry Schumacher is known throughout the classical guitar world as a performer, experimenter, musicologist and music maker extraordinaire. He loves to perform and promote new works, which is just what he’ll be doing at his performance, set for 7 pm Saturday, March 2, at the Lincoln City Cultural Center. The program will include two premieres: “Suite for Baroque Lute” by Eric A. Foster of San Diego, Calif., and “Divertimento Barroco” by Leo Brouwer of Madrid, Spain. Both compositions were commissioned by Schumacher. “Both suites are in a quasi neo-baroque style,” the performer said. “All that was old is new again!” He’s also planning a bunch of Bach, and a selection of show tunes. Schumacher served in the Army and earned a bachelor’s degree in economics and psychology, but it wasn’t until he was 30 that he began to play the guitar. He studied lute and guitar performance and composition at Lewis & Clark College and Marylhurst University, then joined forces with Portland luthier Robert Lundberg studying lutes and their music. It was a collaboration that lasted from 1978 until Lundberg’s death in 2001. Schumacher has developed designs for lutes and guitars with the help of many other world-class luthiers, including Jeffrey Elliot and George Smith. His renowned 11-string guitar design is being manufactured (hand-built) by Kenny Hill Guitar Company in Felton, Calif.
A lifelong student, Schumacher has attended master classes in lute, guitar and theorbo in many locations across North America, including the Eastman School of Music, the University of British Columbia, Northwestern University and the University of North Carolina. From 1987-1998, he served as the music editor for the Lute Society of America. Tickets are $25 in advance, $23 seniors, $10 youth ages 18 and younger, with a $2 discount for LCCC members. To purchase, head lincolncityculturalcenter.orgor drop by the LCCC Information Center, open from 9 am to 5 pm Thursday through Monday (closed Tuesday and Wednesday). For more information, call 541-994-9994. It all started 25 years ago in the back of a thrift store in Prague, where Jetty Swart stumbled upon a fancy accordion. She smuggled it back home and stared at it for a couple of weeks before she realized that now she had to learn how to play it, and write songs. And sing them. 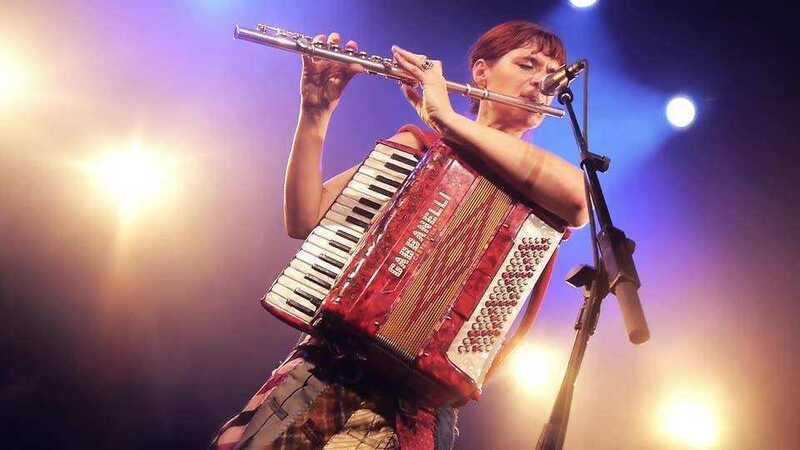 Since then, the Dutch-born Jetty has become the World Wild Accordion Diva, playing from the streets of New York to theaters and festivals in France, to the Lincoln City Cultural Center. The LCCC is proud to present the Jet Black Pearl Trio, performing at 7 pm on Sunday, Feb. 24, in the groovy and acoustically refined auditorium at 540 NE Hwy. 101. Doors will open at 6:30 pm. After finding her accordion, Jetty moved far away from her skeptical Dutch friends and family, and started playing in the streets of New York while working on an internship in graphic design. She then moved to the south of France, where she began busking in the streets while learning to speak, write and sing her new songs in French. She found that the natives liked her silly songs and strange accent, and as the band “Yeti” found herself booked in theatres, festivals and stages big and small. Jetty sings, raps and beat boxes about slugs in love, criminal gurus and hallucinating butterflies. It was in France that she met “The Amazing Bubble Man,” and moved with him to Portland, Oregon. She began singing in English, but never lost her strange accent. She now sings in English, but she’s kept her strange accent and her faithful fancy accordion. With her Jet Black Pearl Trio (Tom Goicoechea on drums and Bill Athens on bass) Jetty sings, raps and beat boxes about slugs in love, criminal gurus and hallucinating butterflies. 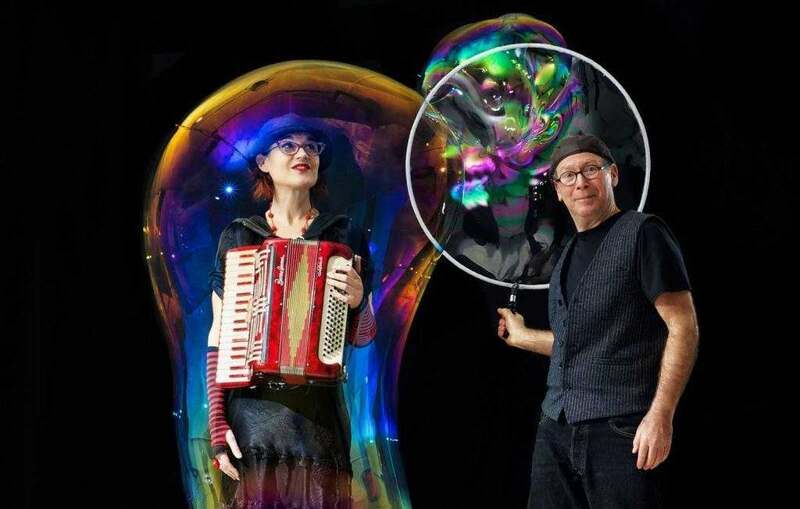 She also accompanies the ABM when he performs his bubble show around the world – in fact, Jetty’s been on the LCCC stage twice before, beat-boxing and playing accordion as the soapy stars filled the air in the annual Festival of Illusions. Jetty’s credits on this side of the Atlantic include the Accordion Noir Festival (Vancouver, BC), Utah Arts Festival (Salt Lake City), Moisture Festival (Seattle), Trails and Vistas (Lake Tahoe), Accordions Around the World (Bryant Park, NYC) and of course, the Oregon Country Fair. Club gigs include Dante’s in Portland, Amnesia in San Francisco and the Annenberg Beach House in Santa Monica. “A formidable force of music, and truly has to be seen to be believed.” (Three Weeks, Edinburgh Fringe Festival). “The most eccentric and equally the most talented woman you will see in Edinburgh this month” (Broadway Baby, Edinburgh Fringe Festival). Tickets are $15 in advance, $17 at the door, $10 for youth, with a $2 discount for LCCC members. To purchase, head to the events page or drop by the LCCC Information Center, open from 9 am to 5 pm Thursday through Monday (closed Tuesday and Wednesday). For more information, call 541-994-9994. Oregon is experiencing a shift in the landscape of creative spaces in our communities. Population changes, (dis)investment, public policy or the lack of it, and climate change have all had a hand in opening, closing, and changing places that are important to us culturally and creatively. The natural world — of which we are a part — is constantly changing and evolving and has much to teach us about living in these times. Can we find inspiration from our natural surroundings to imagine new ways to build creative spaces? This is the focus of “Ecology of Creative Space: Gathering Inspiration from the Natural World,” a free conversation with Maesie Speer at 2 pm on Sunday, Feb. 17, at the Lincoln City Cultural Center, 540 NE Hwy. 101. This program is hosted by the Cultural Center and sponsored by Oregon Humanities. Maesie Speer was born and raised in Memphis, Tennessee, and is passionate about building inclusive and nurturing creative spaces. She is the programs manager at the Caldera Arts Center outside Sisters, where she lives, works, and explores. Prior to moving to Central Oregon, Maesie lived in Portland, where she administered arts and culture initiatives and scholarship programs for the Oregon Community Foundation and worked as a health education consultant. A lifelong theater-maker, Maesie is a past company member of Hand2Mouth with whom she created and toured for ten years. She has also performed with Theatre de la Jeune Lune, Sojourn Theatre, Actors Theatre of Louisville, and Artists Repertory Theatre, among others. She volunteers as a board member for the Central Oregon Arts and Culture Alliance and as a program committee member for ScaleHouse in Bend. 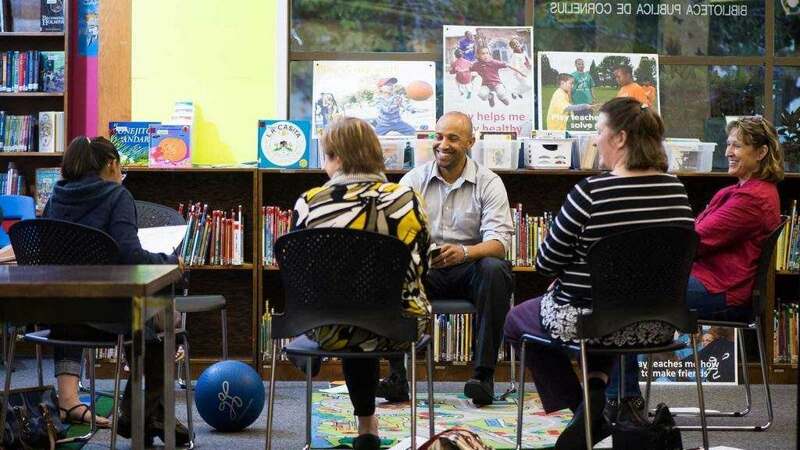 Through the Conversation Project, Oregon Humanities offers free programs that engage community members in thoughtful, challenging conversations about ideas critical to our daily lives and our state’s future. For more information about this free community discussion, please contact Niki Price at 541-994-9994. Oregon Humanities (921 SW Washington, Suite 150; Portland, OR 97205) connects Oregonians to ideas that change lives and transform communities. More information about Oregon Humanities’ programs and publications, which include the Conversation Project, Think & Drink, Humanity in Perspective, Bridging Oregon, Public Program Grants, and Oregon Humanities magazine, can be found at oregonhumanities.org. Oregon Humanities is an independent, nonprofit affiliate of the National Endowment for the Humanities and a partner of the Oregon Cultural Trust.